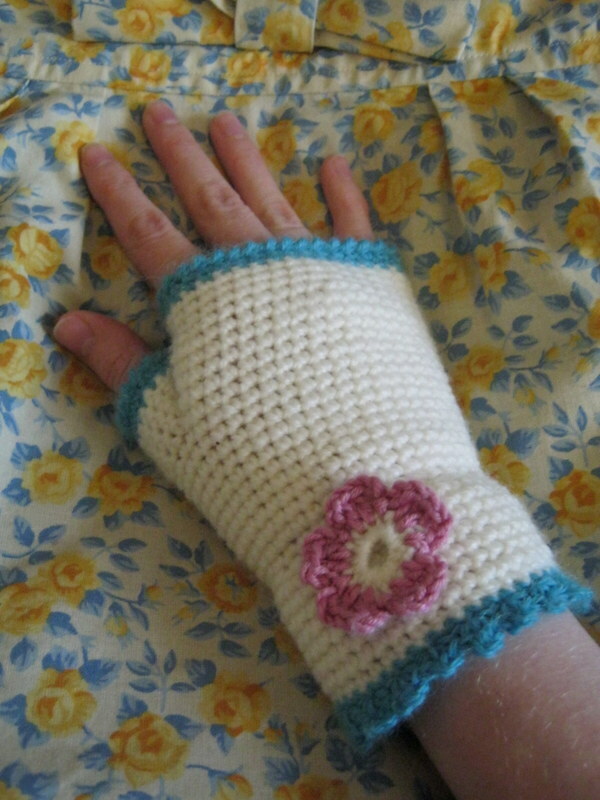 Knit and Natter and Crochet Mittens. Last Saturday saw the first of (I hope) many ‘knit and natter’ mornings held at a local handmade craft/coffee and cake shop. In one of my recent posts, I mentioned that I’d been along to a local knit and natter group and just before the Summer, I mentioned I was running a few craft workshops. I’ve been talking to a lot of people who have said that they would like to be involved in a kind of regular crafty group. I know there are a few that happen during the day (Love 13, where we were, have their own knit and natter every Friday morning), but for those who work or have little ones (which is a job in it’s own right! ); weekdays aren’t always particularly practical! So I thought I would set my own one. I have to say it was rather fun! Just under 10 of us came together; drank coffee; ate cake; chatted; oh and crafted. There were a few people doing mending, some sewing, some knitting and others (like me) crocheting. All in all, it was a very enjoyable morning, with a lovely fun atmosphere. Now I didn’t take any pictures as I didn’t want to scare anyone away (!) 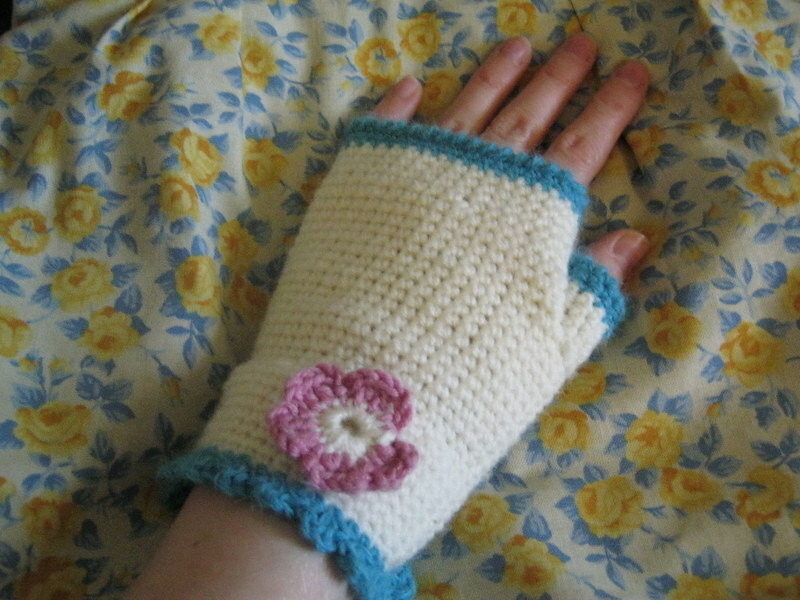 but I did manage to knock up a pair of mittens. Would you like to see them? I took the pattern from this lovely book by Nikki Trench. I changed the pattern slightly (I added a couple of flowers from another project in the book and changed the trim on top and bottom). I also used a 3.5mm hook as I’ve made them before and they came up slightly big. To do the trim on the top of the mitten and the top of the thumb, I chained 1 then worked one round of ‘dc’ (UK – I think the USA term is ‘sc’?) in the blue. I then chain 1 and worked a second round of ‘dc’ joining with a slip stitch to the slip stitch from beginning of the round. Without turning, dc back along the round (this will create the twisted effect). To do the bottom, I chained 1 then worked 1 round of ‘dc’ in blue, joining with a slip stitch into the chain stitch from the beginning of round. Then * dc, chain 3, dc* into every other stitch from previous round. Finally I sew the pretty flower in place. I love the colours, the white and the blue but they really needed something else to set off them off properly. At the beginning of the year I said that I would try not to buy any wool this year and work completely from my stash. Now I have to admit that I treated myself to the blue wool earlier this month from the Knit and Stitch Show at Alexandra Palace (lovely soft Alpaca wool, which I used to make a snuggly warm hat – yes another hat). Well it was a birthday present, so maybe I can be excused! Anyway, I used some of what was left over in this project (I still have enough left over for a little hat or maybe booties); and the other wool was from my stash. 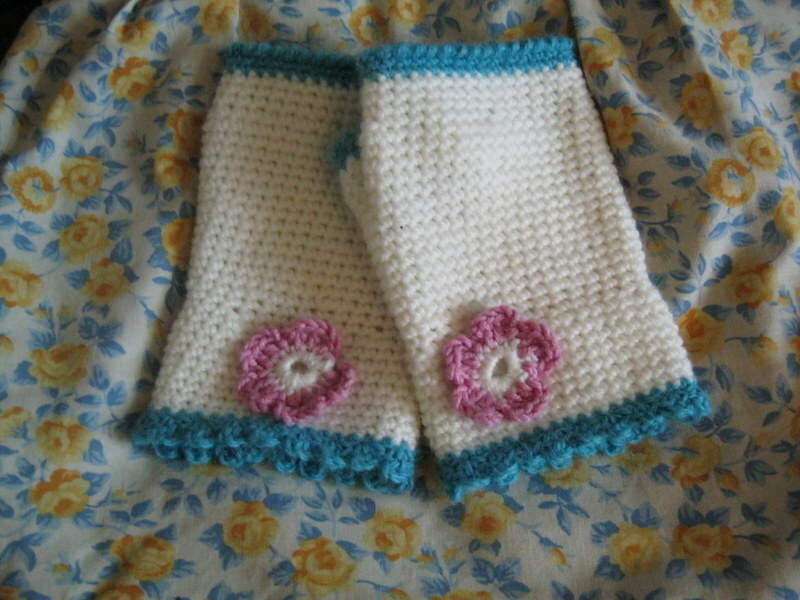 I have to admit, I’m pretty pleased with them, they are nice and warm. I’m even more pleased that the crafty morning was a success, and have already set the date for next months (where I think we might have a Christmas theme, as it’s never really too early to start crafting for Christmas, in my opinion! ).